Seth MacFarlane is a bit of a controversial figure. Sure, Family Guy might be one of the longest-lasting animated shows on television, but I’m not a huge fan. After all, the man can be problematic...to put it mildly. Yet, his new show, The Orville, coming later this fall, is one I’m very much interested in...because of something I am a fan of: Star Trek. Even though there’s an official Trek coming out, this one might end up coming out on top. The Orville is a scifi dramedy about the captain of the U.S.S. Orville, a mid-level exploration ship, set 400 years in the future. The show looks to take a lot of inspiration from the original Star Trek series, and that’s no coincidence. MacFarlane is a fairly big Trekkie (or Trekker, depending on your preference) himself, so much that he wanted to wanted to help a television revival, shortly after the one for the big screen. In fact, he pleaded his case back in 2011 during an interview with The Hollywood Reporter. “I don’t know who would give me the keys to that car…But I’d love to see that franchise revived for television in the way that it was in the 1990s: very thoughtful, smartly written stories that transcend the science fiction audience,” he said. MacFarlane was never able to secure the keys, so he went ahead and made a copy instead, and you can see plenty of references to the original franchise in the trailers. Cool alien makeup, epic sweeping shots of ships, and a crew that’s both competent and kind of sarcastic. Star Trek: Discovery, the upcoming series officially based in the Star Trek universe, is a different thing entirely. It’s a serious drama set 10 years before the events of The Original Series, drawing on the iconic story (for example, the protagonist is Spock’s secret adopted sister) but also feeling a little removed. I mean, behind-the-scenes issues aside, it looks like a competent scifi epic with many of the bells and whistles that resonate strongly with fans of the genre. Hence why there’s more than a passing resemblance to both Battlestar Galactica and Mass Effect, to name a few. But what about Star Trek itself? Well, other than a few familiar names and symbols, the connections are hard to trace. It was revealed that Tribbles might show up, so there’s that at least. The one thing that the original Star Trek and its many spin offs pushed was the message of hope—that some day, humankind will get its act together and we’ll all make space-friends. But there’s another key ingredient, that being a sense of humor, one that appears to be sadly missing in Discovery. At least from what has been shown thus far. Who knows, maybe there will be an episode on the same level as, say, that episode of Deep Space Nine in which everyone learns how to play baseball against a bunch of surly Vulcans? If there is any levity, it might not work itself into any trailer, since pathos is far easier to package and sell. Then again, given how Discovery appears to take more than a few cues from other works of science fiction, none of which are laugh riots themselves. 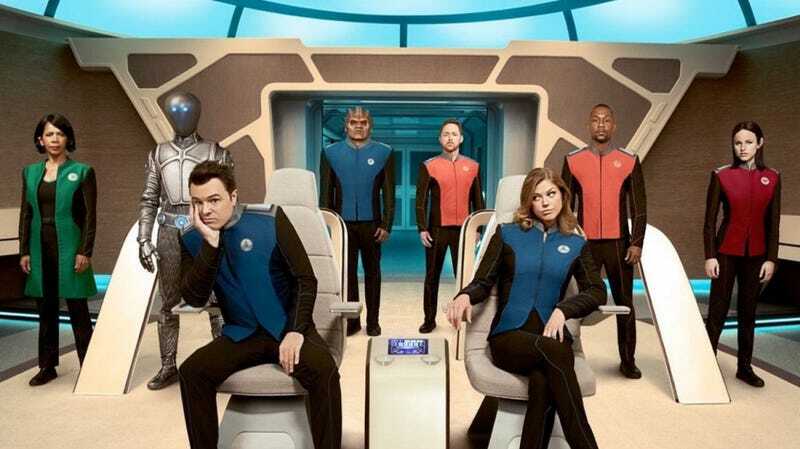 It’s also not to say that The Orville looks to a work of staggering comedic genius. Yet there’s a feeling of lightness that is sorely needed, especially these days. The real world’s forecast looks pretty grim, so this is actually the perfect time for something like Trek, to remind us that human beings are not destined to annihilate each other. The last thing we need is something that’s equally dark and dreary. Ultimately, I too would have much preferred Galaxy Quest: The Television Series,which Amazon sadly put on hold last year, but at the very least MacFarlane has managed to demonstrate an understanding of Gene Roddenberry’s vision. Not just while at San Diego Comic-Con while he promoted The Orville, but also years prior when talking about the Cosmos reboot that he became involved with. Like all Star Trek fans, I remain cautious about Discovery. After all, that’s what the show taught us, to always hope for the best! Plus there are most definitely things to exciting about, like Anthony Rapp being cast as the first openly gay character, and another Asian captain, one portrayed by the always amazing Michelle Yeoh. Plus, I also dig the look of the two new Federation ships, which have allowed me to become more comfortable with the design of the NX-01, from Enterprise, something that I originally despised. But at the very least, there’s another ship to hitch a ride on if the Discovery or the Shenzhou’s voyages don’t pan out.